We’d love your help. 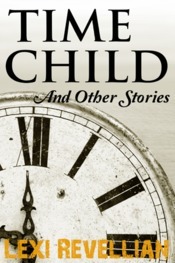 Let us know what’s wrong with this preview of Time Child and Other Stories by Lexi Revellian. Time Child: Theo is visited by herself as a child and can't resist giving advice. Comforted by Darkness: Who is the mysterious dark stranger waiting for Joss? Mr Conway's Heaven: Mr Conway is pleasantly surprised to discover there is an afterlife - but is it what it seems? Showing Them: Lucy decides to show the agents who rejected her novel. Lucy in Disguise: Surprises at a university vampire-themed party. Jezza's Feathers: Marcus's teenage guardian angel has a message for him. To ask other readers questions about Time Child and Other Stories, please sign up. Though I enjoyed them all, the title story is easily the best of the lot, and might be worth exploring in novel form, but then I say that about most short stories I like--I prefer to get lost in a book for hundreds of pages and hate when they're over so soon. All things considered, the short story is probably best for this concept. When I started reading this I couldn't remember why I had bought it and I'm not normally a fan of short stories but this hooked me from the first page and I struggled to put it down and I enjoyed the variety of stories. My only criticism is that the stories ended at 79%. The title story really had me thinking and prompted conversations with friends. Totally different to her last good read, but thoroughly enjoyable with a mixture to whet the appetite. I am loving this new author and highly recommend. I will post my review when I've finished reading it. Some of these stories resonated more with me than others. I particularly liked Time Child and Mr Conway's Heaven. In fact, I think the book is worth getting for Time Child alone. It is a story that I don't think I will ever forget. I enjoy reading intelligent, pacey books with humour, and that's what I try to write. I believe it's a crime to bore the reader.